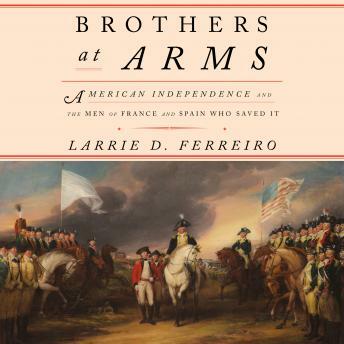 In this groundbreaking, revisionist history, Larrie D. Ferreiro shows that at the time the first shots were fired at Lexington and Concord the colonists had little chance, if any, of militarily defeating the British. The nascent American nation had no navy, little in the way of artillery, and a militia bereft even of gunpowder. In his detailed accounts, Ferreiro shows that without the extensive military and financial support of the French and Spanish, the American cause would never have succeeded. France and Spain provided close to the equivalent of $30 billion and 90 percent of all guns used by the Americans, and they sent soldiers and sailors by the thousands to fight and die alongside the Americans, as well as around the world. Ferreiro adds to the historical records the names of French and Spanish diplomats, merchants, soldiers, and sailors whose contribution is at last given recognition. Instead of viewing the American Revolution in isolation, Brothers at Arms reveals the birth of the American nation as the centerpiece of an international coalition fighting against a common enemy.